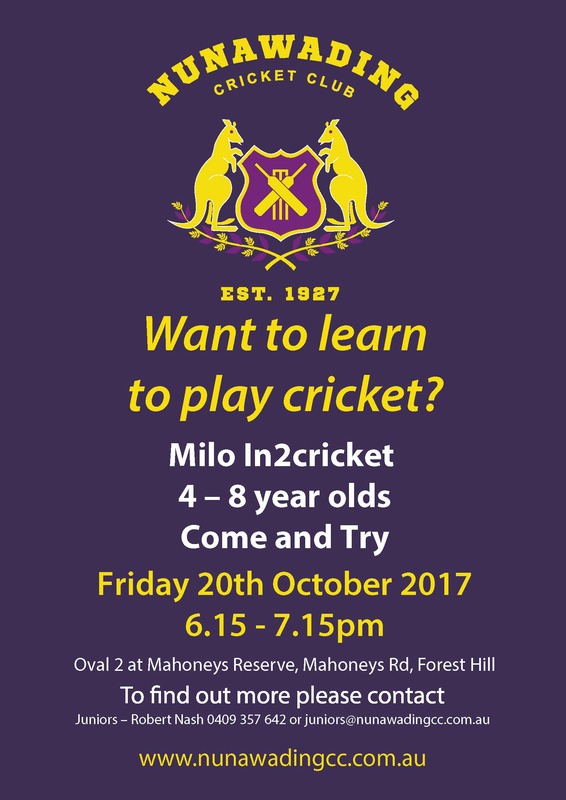 We are looking to attract new players to our Milo in2Cricket program – which this season is being run by our First XI premiership player (and ex District Cricketer) Daniel ‘Smudge’ Smith. Daniel’s son is also in the program this season, and is ably assisted by Jason and Chris. This Friday night we are having a ‘Come and Try Night’ – no cost, no obligation. Please refer to the attached flyer – and ensure all your friends are aware of this (and our Community experience at Nunawading)!! Please also ‘share’ and ‘like’ on Facebook!!! Junior Weekly email to follow later in the week – with details of our Season Launch this Friday Night as well!!! (which is always a great night)!! !